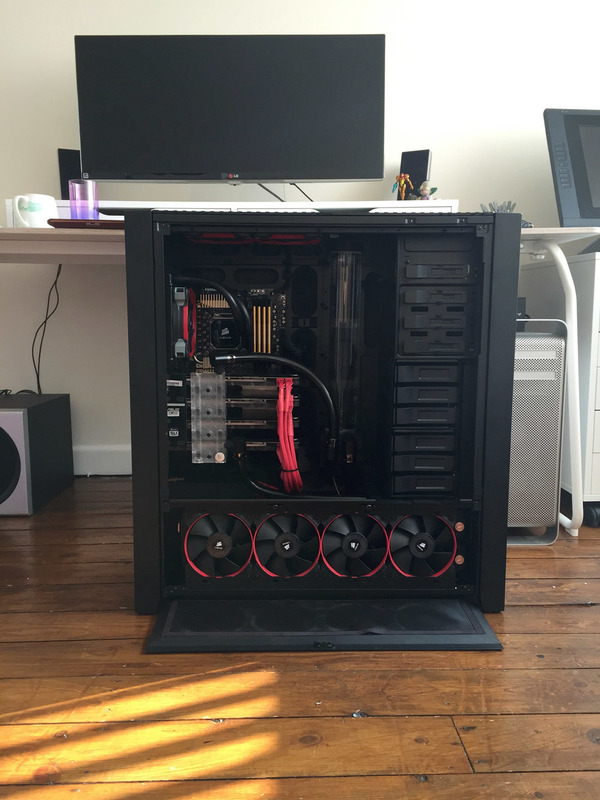 TLDR: I now have a very large PC, within it's spacious interior are four water cooled GTX 980's. It is fast. Request: Please don't email me any questions about hardware because there's a really good chance I won't know the answer. I will kindly defer you to Tom Glimps; he is very knowledgeable, very friendly, and for some reason absolutely loves this stuff. As you may have read, I recently moved from Berlin to the UK and will be freelancing here from now on. As such, I needed to upgrade my hardware to accommodate serous rendering. To add some drama, I had a job lined up as soon as I landed so I needed new hardware pretty soon. As you also probably know I'm a Mac user, and I generally don't know exactly what's inside my machines and I don't particularly care as long as they work and run the programs I use. Recently, that pretty much ceased to be the case. Otoy recently revealed the great news that future versions of Octane would support OpenCL, so the 'new' Mac Pro's can finally join in the fun. This news, alas, would not render my projects between now and the release of Octane 3 so I needed to make a move. This meant for the first time in over ten years I would have to buy a PC. I'd gotten used to using render machines at the office in Berlin that were basically mid-range gaming machines loaded with 4 GTX Titans, and I knew that the (out of production) 780 6GB was great because I have one stuffed into my 2008 Mac Pro. My first thought was to do something similar: buy a regular PC, find four 780's and stick them in there, but then Tom Glimps posted this article about Sebastien/Smicha's watercooled 4x780 rig..
A lot of it flew over my head, but what stuck in my mind was that by not cooling the cards properly you could potentially lose 40-45% performance. I talked to a few friends and decided that for such a big investment I may as well spend a bit more get something that performs really well. I'll be working on my own with no option to just add more machines to my office, and the possibility to use a farm or cloud solution doesn't exist just yet, so I need to squeeze every last drop from this machine. Paying for four cards and getting the speed of less than three sounded less than ideal, so I decided to go all in and watercool them. I turned to Scan Computers in Bolton, who are pretty local to me. I have no interest in building machines (the last time I did I was 15 and completing compulsory 'work experience' in a shop via high school) and the back end of Windows confuses terrifies me even more than the front end. Because of warranty/liability implications I would be unable to buy my own 780s, and have the shop build the machine around them, so had to choose cards that were in production. At the time my choice was between the 980 or Titan. Honestly, I didn't feel too great about the 980 because Nvidia pulled the 6GB 780s and replaced them with a kind of similar card but with 2/3 the VRAM. Despite this, after some research I decided to opt for these newer cards rather than the old expensive Titan's. The Titan X was recently released and with 12GB it seems like a really good deal, but I'm kind of glad I tooled up before the announcement. I'm pretty careful with scenes and textures (plus apparently Octane's new out of core rendering doesn't come with too much of a speed hit) and a collection of Titan X would have tipped my machine into REALLY expensive territory. It will take me a while to take Windows into my every day workflow, for now I'm treating this like an obnoxious render farm that glares at me all day waiting to render something. In order to soften the blow I've managed to make it feel somewhat comfortable by plugging it into the same monitor (LG 34UM95 superwide, if you're interested) and using this nice little USB switch to use my comfy old keyboard and Wacom setup. There are a lot of things I already miss from OSX, and because I'm pretty busy I've actually been defaulting to designing on the Mac. Even the fastest machine is slow as hell when the user doesn't feel comfortable, so it will be a learning curve for sure. As this machine was bought almost exclusively for rendering in Octane, and I've filed this under my Octane blog then you may be interested in the Octane Bench score: 406.19. In practical terms, it's really really fast: It turns a 5-6 minute frame on my single 780 in the Mac into 1 minute or less. So as I mentioned at the top, if you have any questions... please don't ask me. I can really recommend checking out Tom Glimps' site because he has a lot of news, opinions and general information on GPU based rendering and hardware. He's also a great CG artist! The engine and its plugin is not without issues, but the tangible progression is some of the fastest I've seen. Since the beginning of the year, displacement and incredible 3D motion blur have been added, plus a lot of workflow improvements. In fact, as I type there is still an update that I'm yet to install that introduces a node-based material editor for Octane materials inside of C4D! As with most new and exciting developments, the first few months are spent doing things that you want to do, not things that you have to do. Moving from tiny throwaway test scenes to self initiated art projects and then eventually to fully fledged client work. The gap between these three things is vast, and recently I and my colleagues have started to hit a few walls here and there. As I suspected, there are a few current limitations with the material system meaning you have to compromise a little regarding physical setups: there is no layer/coat system comparable to Vray's specular layers (or R16's new reflectance channel), so varying glossy surfaces and volumes have to be mixed rather than stacked. The C4D shader integration is limited to things that can be 'baked' on the fly to image maps (so mainly noise and gradients). There is a great random colour shader, but still no MoGraph support. The big one regarding real projects is render times. "But Octane is incredibly fast!" I hear you cry. Don't get me wrong, it definitely is. It speeds up the way we work to a degree I can't even estimate. Within days we are now sending clients almost final quality renders (theoretically) allowing creative conversations to develop quickly and meaningfully (in reality it seems to confuse them as to why final HD renders take so long because the tests look fine to them). Bear in mind that my colleagues and I have always worked in a 'Brute Force' manner. Both figuratively in terms of workflow, and technically in terms of Vray rendering. Compositing for the most part consists of colour correction and adding polish, not rebuilding 3D scenes from passes. Until Vray(for C4D) got it's big update recently there was basically no usable multi-pass system there, so we used a 'point and shoot' philosophy. Make everything look great in 3D, render it boldly and tweak it a little bit. It's no exaggeration when I say our Brute-Force Vray beauty passes usually weighed in between 30-60 minutes on a powerful machine. But who wants to deal with GI flicker? At least grain is unobtrusive and under the right circumstances can even be visually pleasing. This way of working means the lack of compositing tools in Octane don't hit me very hard, but for a lot of people it will be a big problem, it's usually in the first three questions I get asked. So now on crazy 4xGTX-MegaTitanSevenEightySaurusRex machines, HD frames are taking between 2 and 10 minutes for most shots (it really depends on the type of materials) to get to an acceptably low level of noise, which compared to days gone by is a dream come true. The thing is those old 45 minute frames could be put on a render farm, Octane frames can't... unless you have friends with a particularly weird collection of hardware. 10 minute frames on a single machine still adds up to a lot of hours. Otoy has a cloud render service available, and it looks great, but it does not seem particularly simple to set up for someone like me. I really look forward to seeing how this develops and trying it out when there is time to spend on tinkering. My main personal machine is a 2008 Mac Pro. Until recently I had 2xGTX 660s plugged directly into the logic board using mini PCI to 6-Pin PCI-E cables. Last summer I was intrigued and excited by Octane, but buying expensive hardware just to try a demo was out of the question so I bought one of the lower end Nvidia cards. I liked it, so I bought another so I could render twice as fast, and because I knew that the first worked. In general the system was really stable, Mavericks recognised the cards just fine and the Cuda performance was great. Then months down the line as I started rendering heavier scenes, filling up the VRAM more, driving the cards harder.... then my Mac would panic and restart. This caused me to share my Mac's panic. I'm not a tech guy, hardware generally frightens and confuses me, but I knew that these two cards were taking more than my machine could give it (I can't really find a straight answer regarding what is safe to plug straight into the Mac). So recently I changed my setup to have one fast card driving Octane powered by an external PSU, leaving one of the lower end cards running the system and removing the other. This seems faster and safer all round. I now use a GTX 780 6GB, powered by a Corsair CX600M. The power unit sits on top of my Mac Pro and the cables just run through an empty PCI slot. The only hack needed is to jump the PSU with a paper clip so it will turn on. This gives the card more than enough power, and this specific PSU comes with the correct cables for the powerful cards that need 6+8-Pin cables. You can cheat and use a lower wattage supply if you're clever enough to know how to string different cables together. Just to reiterate, if you're a Mac user looking for a new machine, there is not really a current configuration you can buy that is sensible. Thunderbolt GPU expander cases are out there, but really do not make any sense. You can play Frankenstein with an old Mac Pro, build a Hackintosh, or grit your teeth and learn to love Windows (I recently bought a Surface Pro 3... I'm trying). If you think this post was a bit negative, then read the earlier posts. All the gushing and positivity still applies, Octane has changed the way I work and the toolset continues to grow. It's speed during production is great, lighting and building materials in real time is a dream, but it's important to talk about the realities of the new technology. I haven't rendered a Vray project since February after 4 years of using it exclusively, but that's probably not going to happen for everyone. So after a year, Octane is showing its flaws in a production scenario as you might expect, but for me the positives heavily outweigh those negatives. I thought I should probably update this Octane blog once in a while, especially as it's now part of my everyday workflow. I unfortunately don't have any cool images or animations to share at this point, everything is under wraps for the moment, but I can say the last few months using Octane every day have been really enjoyable. I've not spent anywhere as much time with it as I would have liked since this slice of heathen; the end of last year and the start of 2014 was taken over by a monster of a Vray project (which is unfortunately under NDA, sorry!) so I've been itching to get back to real time GPU rendering full time. Only time will tell how many of these features make it into the C4D plugin and how long it will take but the chatter on the Otoy forum seems to be pretty optimistic. The only features I would be left wanting after this would be a solid multi-pass system for compositing (although if I can help it, I try to avoid that anyway, and Vray C4D took approximately... forever to implement a good solution!) and better integration with the C4D shaders. To clear up any misinformation from earlier posts: simple C4D shaders like noise, gradients etc work perfectly in Octane; more complex shaders such as Mograph Color/Multi, Filter, Layer etc. still do not. This has been the biggest hurdle for me to overcome while working day to day. Since February I've been working on a really fun short film with Zeitguised (watch this space!) which is rendered entirely in Octane. There's been more than a few times I've wished for Mograph Color shader functionality, it can often be worked around (sometimes leading to surprising new results) but what would usually be simple tasks can become bigger problems. Luckily, being our own client for a while meant we could bend without breaking. A vague hint at new work, watch this space. Having said that, niggles aside, the speed and fluidity of using the GPU renderer has been incredible. I'm currently rendering final HD shots on my old Mac Pro with cheap 660's at 3 mins per frame across the room from me at home. A more taxing shot (takes 25 mins on a single Titan) is blazing away at 6 mins per frame on a crazy PC stacked with 4x780TI's. The power is scalable in a pretty predictable way which is really nice, of course every render isn't going to fly by at 30s per frame, especially with our infamous gratuitous use of SSS and gross polygon misconduct, but comparing the speed to a recent project full of glass and liquid completed in Vray is unbelievable. The process of texturing, shading and lighting a scene is infinitely more organic than I've ever experienced. For C4D users, Vray RT is still a dim light on the horizon, so the jump from waiting minutes per frame to see incremental shifts in light settings or material parameters to moving a slider and seeing it in real time is monumental. I can load a HDRI, rotate it round 360° and see how the light bounces around the scene for every rotation within 10 seconds. I can figure out exactly how much roughness to add to reflections with a few nudges of a slider. It's fast, seriously fast. 1) "Is the render quality as good as Vray?" 2) "What computer should I buy?" The computer question is much more difficult, especially for Mac users. I can't imagine a tougher time to be buying hardware. Until the CUDA/OpenCL disparity shakes out then we are forced to welcome our Nvidia overlords. You need a CUDA card. This means you currently cannot buy a new Mac Pro (you know, the little tube-shaped guy) and use Octane. Either find a used last gen Mac Pro and fill that aluminium box to the teeth with CUDA cards, or buy a PC. My friend just built an incredible hackintosh based off information from tonymac. If you want to run Nvidia cards with OSX, you should check that site out to be safe when buying hardware, it's quite possible you will need an external PSU to give the card enough power to run safely. I'm sure I'm not alone in hoping that Apple will make the next round of Mac Pro's a little more expandable, whether it's internal or external. The easy answer: If you're a PC user, then good news for you... buy whatever the hell you can afford! It's pretty simple, two Titans will render almost exactly twice as fast as a single Titan. The only thing to bear in mind is the memory of each card doesn't add together, the scene is loaded into each one individually. 4x 4GB cards can still 'only' load 4GB worth of scene (geometry+ textures), but they will render it really, really, really, really fast. In conclusion: still a little way to go for full C4D integration, and depending on your requirements for compositing it might not do the job, but for me I can say Octane makes me very happy! Seriously fast. I've been a Vray user exclusively for the past 3 years and always thought it was pretty quick in relation to its photoreal quality compared to C4D's native render engine/s. Octane blows that speed out of the water, and that is on my old 2008 Mac Pro with some new mid-range graphics cards. I'm talking moving around the lit scene in real time, making light and material adjustments on the fly and if you let it stand still for 2-3 seconds you get a decent image that would have taken Vray a minute or so. So far even 'final' quality type renders (albeit at low resolution) have not yet exceeded a few minutes. After wading through, and still never REALLY understanding a lot of Vray's jargon, this basically gives you a global quality slider and few extra tweaks to samples for specific areas like glossy reflections and lights. There is a 'preview' style render (Direct Lighting) that utilises some kind fo Brute Force GI to approximate, and a choice of two 'final' settings (Pathtracing/PMC) that seem very similar, the latter being better suited to handling more subtle phenomenon like caustics from what I read. It's unbiased, there is no guessing of where light samples need to be (which, from what I can assimilate from opinions on Maxwell, in the past meant perfect but slow renders). But as I mentioned, and will probably continue to mention, octane is fast. The physical 'thin film' sure would have made my life a lot easier for this MTV Live bubble's project. More on the materials in the next post, because this area is the trickiest to transition to in terms of the learning curve. Things to note: image sequences are supported in the texture node. Some of the little texture workflow functions work but not all (Vray also is missing some integration here), for example 'removed unused materials' is fine, but 'remove duplicate materials' doesn't work. Mograph is fine, render instances are fine, all generators and deformers seem to be solid. Apparently Xref's are supported, though to what extent I'm not sure (in terms of materials being imported etc) but Xref's historically don't agree with me. I've not tested everything extensively, but because of the way it exports geometry first and 'voxelises' every frame I see no reason why anything shouldn't work. This for me is the main selling point to use the integrated plugin for C4D. When you work quickly and iteratively I can imagine constantly baking and exporting to the standalone wouldn't be great for workflow but now we get the speed directly in our cozy C4D UI! Some tests of a C4D sculpt painted in 3D Coat. All images took no longer than a few minutes. And please bear in mind I'm a motion designer, this kind of thing isn't in my usual bag of tricks! • 'post effects' like bloom and glare are actually pretty useful. • Panoramic is worth looking at. • Camera distortion is controlled via a slider. I'm not sure if this is influenced by the focal length at all or if it's an arbitrary effect, it seems to be able to push to extremes in terms of pinch and bloat. • 'Colour Mapping' (as it is in Vray) doesn't seem to exist. You have the option of using Linear colour space or there's a long list of film types to choose from. These have a massive impact on the colour and contrast sensitivity. Neither image had any 'post processing' outside of Octane. Both had their film type changed on the fly while rendering - the high contrast image will actually be slightly higher quality in terms of samples because it rendered slightly longer - despite the noise being emphasised. What all of these things mean for me initially is that I'm not sure how simple it would be to bring in real world values from a shoot and match to a plate mathematically (I'm sure it is possible) . But it does offer a huge amount of artistic control to really play around with how you want an image to look. Scattering is one area that is really hard in Vray to eliminate flickering in animation. I'm far from 'comfortable' with it yet but at least started to get some visible results. In Octane you have 3 main categories of materials: Diffuse, Glossy, Specular. Specular is weirdly named coming from other render engines, this is actually the refractive material. the others are self explanatory. There is also a mix material for plugging two materials into. I can't find an equivalent to Vray's '2 sided' material for thin 'SSS' like leaves and paper so I'm yet to discover how to build those types of shaders. After a quick look through the Live Database, it seems common practice within Octane to have to mix materials, SSS is not available in the Glossy material type so one must first establish the SSS effect in a Diffuse or Specular, then mix in a similar Glossy material to get reflections. If you've spent any time at all studying/building 'realistic' shaders in Vray or similar you will know that a fully diffuse material with no reflective qualities at all doesn't really exist in real life. I'm not sure why most solid materials could not be achieved using only Glossy, Specular, or a mixture. Time will tell.. Note: The black/pink SSS image here is NOT used in that 'final' result. 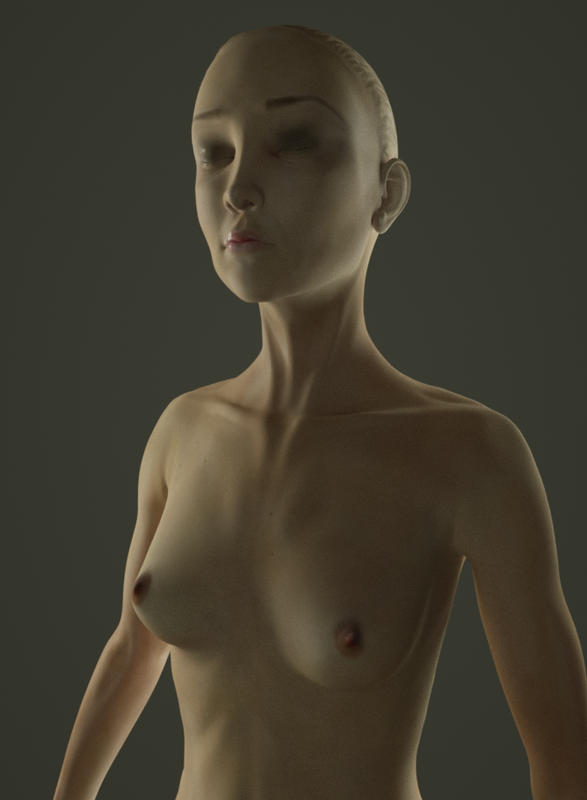 Only an exaggerated test with a simple diffuse channel to emphasise the translucency. The physical properties are pretty similar to Vray, therefore a real world camera. Albeit with 'cheat' controls for tuning depth of field without upsetting your exposure. 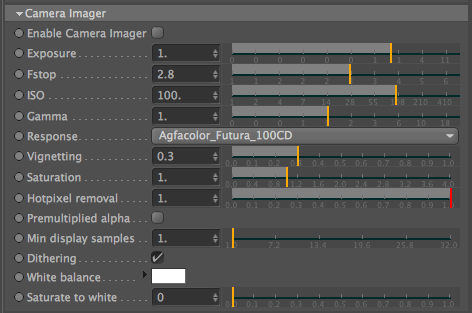 To turn on DOF, all you do is select a number higher than 0 in this aperture slider. There is another section of settings for the camera settings you expect to see, F-Stop, ISO. The F-stop controls the depth of field obviously, but this can also be VERY easily tweaked using the ‘aperture’ value within the thin lens without affecting exposure. It’s very cool. However, there’s 2 things (bugs?) that I found out after some confusion. Those values I mentioned, the 0’s: once you change them from 0, you can never go back lower than 0.01 (yes I tried typing, and also resetting to default) so once you alter those if you need to get back to NOT using DOF, or to get back to using C4D’s focal distance then you just have to make a new camera tag. I recommend leaving the focal distance at 0 and using C4D's controls, otherwise you lose viewport feedback and the target tag. Lights feel nice and simple, everything seems contained in a few fields and sliders. - Efficiency is made to control the ‘actual’ power of the light via a float slider - but I’ve found its the best place to stick an ‘RGB Spectrum’ and quickly change the colour of a light! - Sun works almost identical to Vray, ‘sun size’ affects sharpness of shadows, the rest is controlled by C4D's settings (location/time). To lock the frame size, choose a resolution in Octane Settings/preview and ‘start preview’. This will make a render in the Live Viewer at the size you want. Then click the lock icon so it greys out, when the Live viewer is resized the frame stays the correct size and dimensions. If you don’t do this, you can drag the window size around and end up with a random frame dimension that doesn’t resemble your viewport (which is kind of cool, but then not really reproducible in the final render). Get used to twirling down the little arrows to access RGB pickers and sliders rather than clicking through levels of textures. Octane uses a lot of 'textures' where you would usually expect a slider, usually a ‘Float Texture’. Twirling down the arrow on those elements allows quicker access to the control you actually need. Otherwise it can get frustrating clicking through sub levels of shaders! This may be something you already do but it was just something that quickly became apparent to me when looking through materials and lights. As previously mentioned, if you turn down the opacity of your lights so they aren't visible to the camera then they do not show in reflections. This drove me crazy for a couple of hours yesterday wondering why the perfectly white areas of my specular map combined with the full black of my glossy map would not appear shiny. Luckily i was using a black environment (via a C4D sky and an Octane environment tag - this is where you would plug in a HDRI) and when I boosted the brightness of the sky suddenly my reflections appeared, somehow (thankfully) this led me to try boosting the visibility of my lights and there we have it. 3 weeks ago I was under the impression that as a current Mac Pro user I had around 2 options if I wanted to buy a new graphics card, which became 1 option if I wanted CUDA. Then I started reading more about it and found out that since Mountain Lion OSX 10.8, the vast majority of Nvidia cards and their CUDA power now run natively. Plug and play. Here is a list of supported cards. 2 weeks ago I bought a Nvidia GTX 660, plugged it straight into my 2008 Mac pro (running Mountain Lion) and everything worked perfectly. Here's why I ended up with two new cards... I'm still unsure if its just better to have 1 really fast card, but right now I'm incredibly happy with how my system is running while using Octane. Per Otoy, It is advised to keep a second card free for running the OS and C4D while using Octane. Because it utilises every bit of juice you allow it to on the card(s) you choose in the settings it causes the rest of the system to freeze up. In fantasy land I would love to be able to assign things on a molecular level but currently Mac OS apps 'choose' their GPU based on whichever monitor they launch on (therefore the GPU that is plugged into). At home I have a slightly weird setup, my Mac Pro is running to 3 'monitors': a Cintiq 22HD (main monitor), a cheap Acer monitor, and my TV. The reason my Cintiq is my main monitor is purely for ergonomic reasons, I have a really small desk with room to only sit in one space - so thats where the Cintiq has to go, therefore its where my head has to mainly face. Before buying the second 660, I tried sticking the (very) old Nvidia 8800 back into slot 2 and running my apps off that, leaving the 660 free to render. So upon testing, if I plugged my main monitor (my Cintiq) into the old card, then C4D opens using that as its OpenGL processor - I can move around C4D as if nothing was even rendering, preferences show that openGL sees only the old card, which is great. But the huge down side to this is every application that launches on this monitor (all of them) will only ever use the old card unless you can specifiy otherwise (which you can't). This means once I progress beyond simple studio tests, my C4D viewport is slow again with a 5 year old card. Frustratingly, the only place you ever get to choose which card something uses is inside of Octane’s settings! In a practical sense, to get by, if you want to use the powerful card for C4D and all your other programs (and why wouldn’t you) then there is a simple checkbox that forces a low render priority (similar to the ‘thread priority’ in Vray, how it deals with the CPUs). Make sure to choose ‘Priority Low’ in the dropdown and check the ‘use priority’ box next to the actual card. Also tell it not to use anything you don’t want it to. My old card did not help render speed, in fact it slows everything right down because the scene has to load into all the GPUs before rendering so it sucked all the speed form the 660. So my current setup is 2xGTX660, the card plugged into PCI 1 is running all my apps at a blazing speed while set to 'Low Priority' is giving Octane as much as it can, then the second card is giving Octane everything is has! This literally halves render time again. I can't recommend that this is the best way to go, I can only document my experience, which so far has been amazing. I recently took the (relatively inexpensive) plunge and decided to try Octane for C4D. It recently became available as an integrated plugin, and even more recently became available for Mac. I thought I may as well see for myself what all the fuss is about. After all, everybody seemed kind of furious that the new Mac Pro wouldn't come packed with CUDA Nvidia cards, which is the one and only thing Octane uses to accelerate its rendering. This blog will be a rough account of my experiences in the early (and maybe later) stages of the learning curve. I'm never going to be a tutorial guy, but hopefully I can bring some information to the table. There's a huge amount that I don't know about Octane, plus it's still in beta so a lot of this information may quickly become erroneous or out of date so I will try and keep on top of facts as the software updates.